Music is such a fun subject to write about, because people become so politically charged when it comes down to what they listen to. I’ve always wondered what specifically drives that passion. If you disagree with the hivemind, you just might get mauled. So be careful dear readers when treading unfamiliar waters. Half Moon Run are a four piece Canadian indie band. They also happen to be based in Montreal, but are from other parts of the country (BC and Ontario). And they have a strong following already, considering this is their second recording. If you look at their website, as of today, you’ll see that their next 18 shows are all sold out. So what exactly are they doing right, to garner such a huge fan base? Well I’m not entirely sure I can tell you, but I’m going to give it my best shot. The first thought I had when I started to listen to this album was, “oh, it’s really mellow and probably has incredibly thoughtful lyrics throughout, so I’ll have to listen intently in order to really appreciate what I’m hearing.” Which had an interesting side effect. I started to notice things about their music. A lot of different parts of songs and sometimes entire songs reminded me of other bands. Radiohead, Bob Dylan, Muse, Mobile, Depeche Mode, Coldplay, Arkells, and Stabilo, among others, all come to mind. And so I started to get frustrated, because I thought their singles from their first album were really something special. Call Me In The Afternoon, She Wants To Know, and Full Circle were so beautiful and natural in their offer. So maybe I made the same mistake as a lot of fans do, I expected Half Moon Run to stay as they were and not be who they are. It was selfish of me. But the truth of the matter is that they didn’t change that much on their sophomore album. They just started to explore some more, and picked up references of familiar faces along the way. It’s kinda hard to slight them for having good taste and wanting to carve out their own path too. I think you should listen to their current two singles, because they are pretty solid. Turn Your Love and Trust are the kind of songs that make you want to turn on your stereo to begin the day. And then you’ll listen to the rest of the album and start to find your favourites. Mine happen to be Narrow Margins and the title track, Sun Leads Me On. 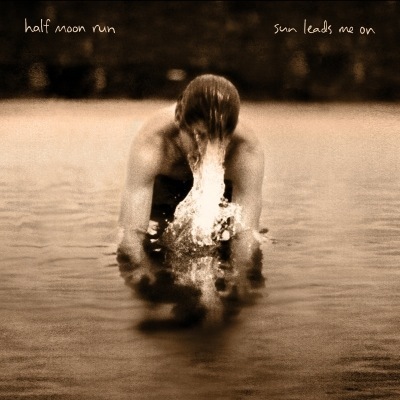 With Sun Leads Me On, Half Moon Run are attempting to shake the title of “that band with that song” and show off how far they have come, and for the most part, it works. But I really do believe that they would have a stronger identity if they played up their quirks some more and sunk into their music with it. The folk elements always work so well with the catchy lyrics and synth-pop influences, but it can get a bit sleepy with all of the slight changes. Would it surprise you to learn that this band is composed of four strangers? I’m unclear on impact that something like that can have on unity, and it doesn’t seem to be a problem for Half Moon Run, but hopefully after two years of touring together, they’ve started to form a bond which will allow them to weather the storm of album number two and become a mainstay in the indie scene. There is a certainly a place for them. And that’s all he wrote. Not much else I can say about this one folks. I do suggest you take a listen, maybe they will grow on you more than they did for me. Though I suspect if I give this album enough listens, it will become part of my musical dictionary before long.